I never thought I would one day make my own chicken bone broth. Even though it sounds very complicated it is actually quite simple. If you have never tried to make your own homemade bone broth here are a few reasons why you should try it. You can get very fancy with your broth and add veggies, herbs etc to it. I decided to not include them in this recipe to keep it simple and because I often just use the broth as a base for creamy soups. If you choose to add veggies I recommend carrots, celery, leeks, onion, garlic. You can get creative with that and use whatever you have home that day. 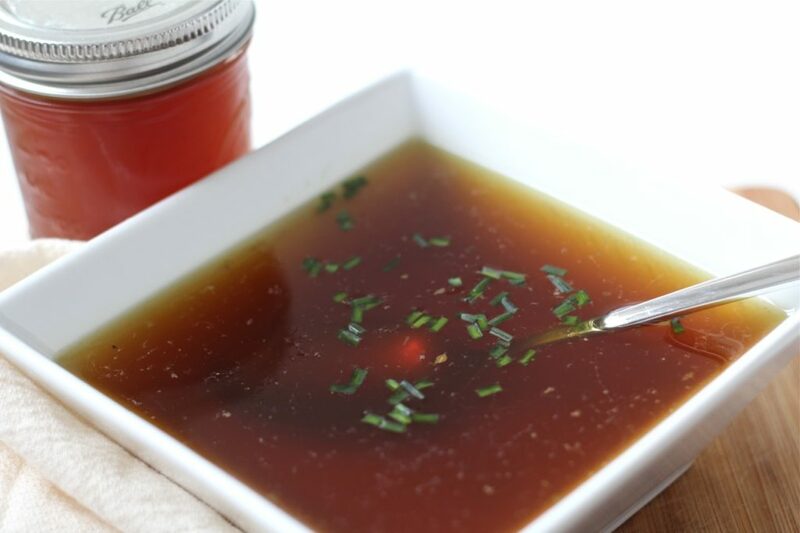 This healing chicken bone broth definitely adds a lot more flavor to your soups. Check out my healthy butternut squash and sweet potato recipe and cauliflower curry soup for some inspiration. But that is not the best part about it. It is really the health benefits that come from consuming bone broth on a regular basis. If you would like to read about it, I highly recommend to check out this link by DR Sarah Ballantyne that breaks down all the details. I make my broth in a slow cooker. If you don’t already have one I highly recommend to get one. It will save you so much time in the kitchen. But you can let the bone broth simmer using a big pot on your stove as well. For my healing chicken bone broth I collect the bones whenever I make a whole chicken. I like to do a lot of broth at once to save time in kitchen. That is why I use 2 chicken carcasses for my recipe. I simply freeze the first one and wait until I make another chicken. I also buy chicken backs from my butcher to add more bones to it. Always make sure to get pasture raised organic chicken bones when making broth. This recipe makes approximately for 6 mason jars of bone broth. As you can see two of them are filled to the top. You can store it in your fridge for about 4 days. I freeze the rest of the broth and divide it up in another 6 jars. When freezing liquid in glass jars you want to leave a couple of inches head space to make sure the glass doesn’t break (see picture). Also let the jars with the broth cool down to room temperature first and then refrigerate them for a few hours before freezing them. After letting the bones simmer for about 24 hours simply remove the biggest bones and pour the broth through a strainer into a large bowl. Finally fill your mason jars (I upcycle jars from for example coconut oil) and let the broth cool before putting it in the fridge. This simple healing chicken bone broth recipe is packed with gut healing nutrients and is a great base for soups and sauces. Place bones in the slow cooker. Cover the bones with filtered water. Let the broth simmer for 24 hours on low. Discard the larger bones and pour broth through a strainer into a large bowl. Fill it in jars and either store in fridge for 4-5 days or freeze. Cool the broth in the fridge first before freezing it.